Eleven days to go and I cannot wait for this whole thing to be over. I am bored, bored, bored. I don’t think it is the story—though it is women’s fiction, and I’ve not been able to introduce any ghosts/demons/vampires and general spooky/violent/gory stuff that I love. I read plenty of women’s fiction quite happily. The thing that is throwing me is not being able to work on anything else. I normally veer between different projects, which keeps me excited and interested in what I am doing. I’ve got loads of other things I want to do and so feel resentful towards my poor Nano project, which really has done no harm to anyone. I’m currently at 30555 words. Do I think I’ll make it to 50K? I don’t know, it’s doubtful at the moment, though I hate giving up on something or letting anything beat me! So I will continue to plod on and see what comes out the other end. 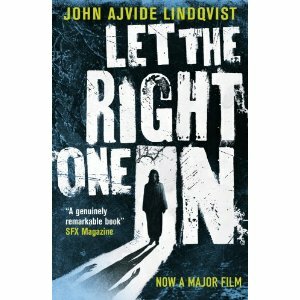 If you, too, wish to escape the tedium of NaNo, you can head to my Facebook Page where I am having a competition to win a copy of the novel, Let The Right One In. Do not give up. Think of the sense of satisfaction when you crack that final word. I'm feeling the same way this NaNo - the project is just not what I want to be working on right now, and my wordcount is suffering because of it. This is why I don't do it. I need to have time to contemplate my work. It's okay for those of you who need the kick-start on a novel. But 50K is barely a novel if you ask me. It's merely the outline. I'm with you, Marissa. I like to put all the heavy stuff in there while I'm writing. Good luck on--what is it? 10 more days left? Wow. Hang in there. No, 50K isn't a novel. There is a HUGE amount still to do after NaNo has finished. I doubt my particular one will be anything like ready until well into 2011. One thing I have learnt in the past few weeks is how to knuckle down and focus on one thing. It's a flaw of mine, diving into one project and then the next. I could be far more productive if I showed some kind of restraint. I described NaNo to my publisher as like being pregnant--at the time it is horrendous, but you look back on it with fond memories, thinking, yeah, I'd like to do that again. I have the same feelings about some parts of backpacking--when you've had no sleep, stuffed onto a bus full of chickens and smelly people, bus breaks down and you end up missing a flight (yes, this happens!). At the time you would cut off your right leg to be anywhere else, but you can't help but look back on it and smile. Keep going everyone! Every thousand words is a thousand words closer! I'm way behind but I want to print out that damn certificate again lol. Personally I'm impatient when I write. I have tried to write parts that interest me when I'm stuck but have found that my brain won't let me function properly unless I write in chronological order. You can do this!!! You're almost there. Just write little chunks of words at a time. Good luck! Thanks Mindy, its not far to go now, though I'm still about a thousand word behind. Still going though!